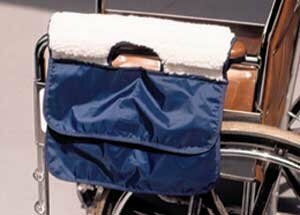 The Hermell Sherpa Armrest Caddy with navy rip-stop nylon & imitation sheepskin fleece. Cane be used with wheelchairs or walkers. Includes two generous storage pockets, one with a Velcro closure and one without, for keeping personal belonging safe and within reach. Two layers of imitation sheepskin helps protect arms from soreness and skin irritations. Size: 14" W x 10" L. Wheelchair NOT included. Sold individually. KANGApouch - Wheelchair/Walker Caddy -"The Handicapped's Friend"